Those were the last words I heard from some Italians I had befriended in Barcelona the day before I was heading down to Pamplona. The odds of that happening were literally 1 in 1.5 million people expected to be reveling during San Fermin. 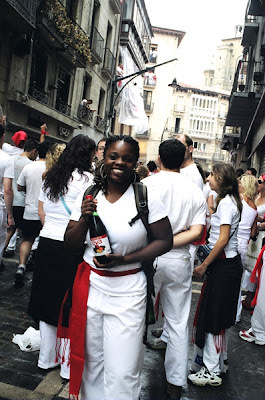 The San Fermin Festival (“Running of the Bulls”) is held every year on the exact same dates – July 6th to July 14th – come rain or shine. As I stood in an overcrowded bus from the train station heading down to Plaza Castillo, eager anticipation could be felt in the air. Strangers stealing glances at each other yet sitting quietly on that bus, knowing we were all going to be experiencing something we’d be talking about for years to come.